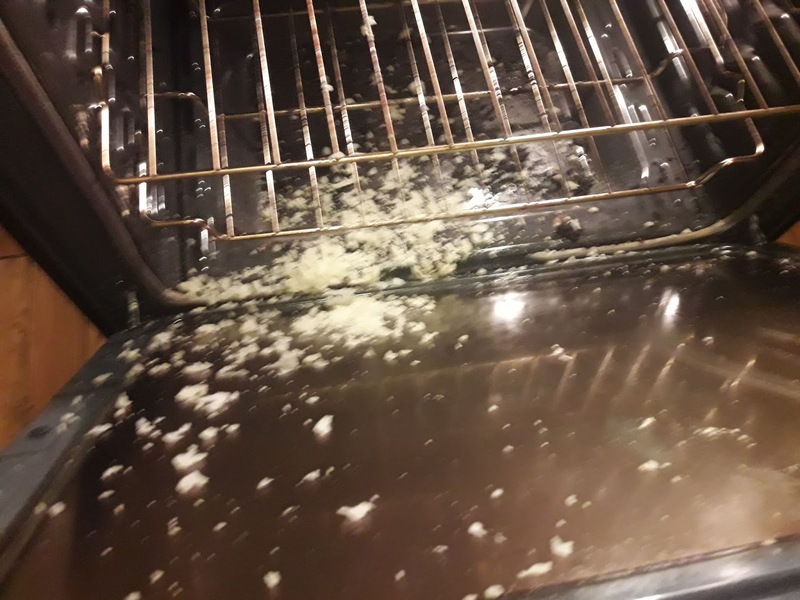 Tonight, I had a little mishap while cooking dinner. 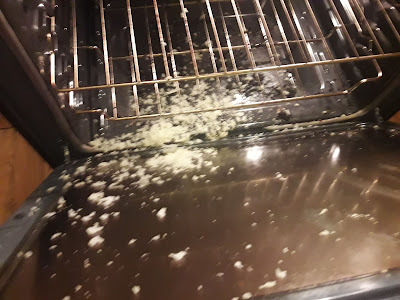 One of my baked potatoes exploded all over my oven. I was not entirely pleased, but we made it work. It kind of feels like an analogy of things. Good intentions blowing up and making a mess. This was not a restful long weekend, but it was good. Friday AM, I left to go to the cabin. Because I was going alone, I decided to go the long route, which added an hour, but kept me off curvy roads. I didn't want to be stuck barfing and dizzy in the middle of nowhere. It took longer than it should have because of traffic, and also because I stopped a few different times. I had a quick lunch at the Varsity in Dawsonville, and it was marvelous. I also stopped to get groceries, and I finally arrived around 4:30. I put things away, did a few chores, then went to see who all was around. I ended up talking with Judi and her husband Alan for a bit, then headed back to the cabin. I ate dinner, and started getting ready for bed. During all of this, I was nursing my right shoulder. It felt weird - like tendon rubbing on bone or something. It hurt like hell. I ended up, before going to sleep, getting in the shower and letting the hot water hit it til the water went cold. I couldn't sleep. My shoulder hurt, and I was anxious about how I would function at work day Saturday morning. Work day ended up being fine. I hurt, but I pushed through, and I managed. I worked with my friend Mary's father. He is a retired bank president, but there's no pretense to him. He works like a maniac, and I tried to keep up. At lunch, Judi left me a note to come to their cabin if I wanted. I did. She and Alan, and my friend Ginny were all there, and we caught up. We worked hard for a few more hours after lunch, then it was the end of the day. We had a quick board meeting, then everyone dispersed. I went home, took another hot shower, and slept for a few hours. Then I woke up, ate a little dinner and crashed again. My plan was to leave at 3AM on Sunday, and make time while avoiding traffic. Done and done. I was home by 9AM yesterday. And from there, I hit the ground running. We were having some HVAC problems, so I called one place, no dice. Called a second place - they could work us in. And within three hours, we had a repair guy at our door. By 1:30, he was done, and I had to take Piper for a bath. She did great. I came home, napped a little, did laundry, took lots of Aleve and Advil... we ended up ordering pizza for dinner, kind of late. This morning, I did a ton of laundry. I exfoliated (more on that another day). Then we ran some errands, and finally, I went to pick up groceries and propane. All of this to say, I feel like I've spent the last four days racing to beat the clock. I spent my time in the car trying to work through a list of things I need to do, and how I'm going to fit them in. It's like the guy spinning plates on poles. I can't keep them all aloft. It's why I really like crossword puzzles, sudoku, magazine quizzes. They are short, and finite, and when they are done, you have a small sense of accomplishment. Whereas in keeping a home going, it never ends. You get the plumbing fixed, the HVAC dies. Fix that and you have to paint. And mow grass, and clean the fridge, and recycle, and pay bills... ALL. THE. TIME. And even if you have that all handled and in control - there are exploding potatoes. I had a good weekend, but honestly, I'm ready for the normalcy of the work week to feel a sense of closure. A final thought. I was tempted to let the oven cool down, pull the racks out and send the dog in to take care of the spud-spew. Cooler heads prevailed.